Have you ever watched Judge Judy in action? If you haven’t, you must. It’s a TV reality show in which the Judge rules on small claim disputes and arbitration matters. What I love about Judge Judy is that her bull**** meter is set to ‘0’! That pretty much is the number mine is reaching too. Unfortunately, it’s considered rude to tell people that that their words and actions are a load of c***. Also, most people are not really ready to hear that, are they? Can I Be Judge Judy For A Day? Here are some examples of situations in my life and how I’d like to respond using a Judy-ism. Add your link to the linky which you will find here and on the post of a co-host. I’ve never watched Judge Judy, but agree. How refreshing to say what’s on your mind rather than stew in silence. Oh O, 4 o’clock, gotta be Judge Judy…definitely Judge Judy…o boy, gotta be Judge Judy. And if it doesn’t make sense it is not true! This made me laugh! 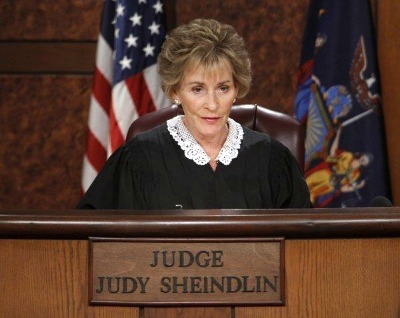 Who wouldn’t want to be Judge Judy for a day! That could be a new show. I never knew about this series Judge Judy but now it appears, after reading your post, it must be very entertaining. In real life, I would want to become Judge Judy to people who always ask me “You don’t speak?” or tell me “You don’t speak” but seriously speaking, I don’t know what to tell them. Any suggestions? Don your Judge robes and tell them you can speak, but don’t want to waste your breath on them! 😉 Ha ha…frankly, I’d just smile and not bother to answer them! Have never heard of the series but going by your post, I can bet it is highly entertaining! I don’t think I can ever be like her… forget being, I can’t even think like her! Ok. 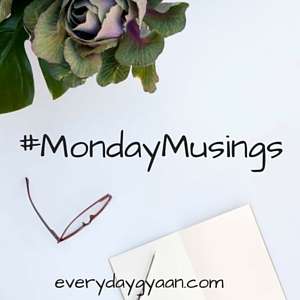 So that’s where “MondayMusings is going to be – Everydaygyaan. I love the new badge and hope to download it onto my web site. Can’t wait to post the first post. Yes, Sunita. Thanks for the feedback on the badge. I’m off to read your post. Love it, Corinne! 😀 I can just picture you in judicial robes. Actually, Judge Judy reminds me of my mother and I have some of those traits as well. Ha, ha! I can imagine you too in that robe, Debbie! Nice to have you back. Judge Corinne you rock! Yes tell ’em! It would feel really good to let off all the steam cooped in! I liked the idea of printing mugs with some of the chosen words, might just do that, and gift it to the ones who deserve to hear it! Adding ‘Awaaz neeche’ to your setof Judyisms! OMGOSH!!!!!!!!!!!!! I loooooooovvvvvve Judge Judy Corinne! And I LOVE this post!!!!! Hahahahahahaha! I have used Judge Judyisms right to the faces of the morons acting like, well, morons.. Hahaha. Great post! You must watch her show, Shalini. You’ll love it!